Whew. Just got back from a 9-hour photoshoot with a great crew of people. The only downside to the day was an icy bike ride over and a finger-numbing ride home. I’ve gotten so used to the light jacket-friendly days of January that this below-freezing weather nonsense in February feels preposterous. I’ll gladly admit I’m a winter-hater, but it does provide a pretty good excuse to cook up some chili. Nothing feels better than coming home on a frigid evening to a hot bowl of chili, accompanied by a side of corn bread if I’m lucky. The following recipe creates a hearty dish showcasing several meat-free, protein-packed ingredients. 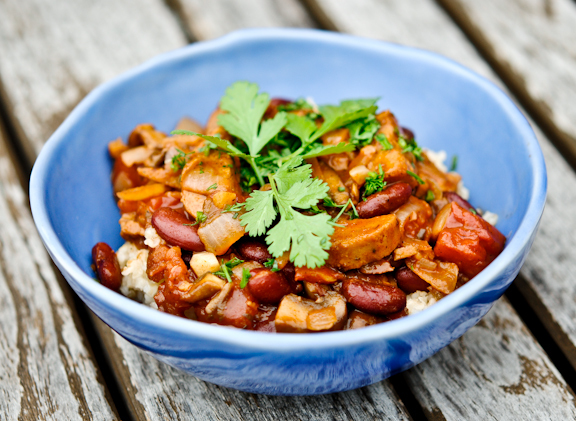 Here, kidney beans team up with vegan sausage to provide around 13 grams of protein per serving. Served atop a 1/4 cup of bulgur (one serving), and you tack another 5 grams on to the meal. Who says protein has to mean meat? This dish is also brimming with flavor. The beans and sausage simmer their juices with those of tomatoes, while being infused with the flavors of chili powder and smoked paprika. Portobellos add that “meatiness” you’d expect from a protein-filled meal, and cilantro tops it off with a vivacious bang of freshness. This is F-F-F chili, vegan style. In a medium saucepan, add 1 cup bulgur wheat to slightly more than 2 cups of water. Cover and bring to a boil. Reduce heat, and simmer 20 minutes, or until liquid is absorbed. Meanwhile, heat oil over medium-high in a large saute pan. Saute onions, peppers, garlic, and sausage for 3 minutes. Add mushrooms, and saute until onions are translucent and mushrooms are tender. Add chili powder and smoked paprika, and cook for a minute, stirring frequently. Add entire can of both kidney beans and tomatoes. Stir in brown sugar, if using. Reduce heat to a low simmer, and cook 35-45 minutes, or until most of the liquid is absorbed, stirring occasionally. Serve atop bulgur wheat. Garnish with fresh cilantro. Sounds wonderful! I recently noticed that we got some new grains in our bulk section at work, one that would go really well with this chili. It’s a type of ferro grain…and I can’t think of the name (darn it!) and it’s loaded with protein (about 15 grams) and fiber (about 6.5 grams!). I will have to write down the name and get back to you…. Grace, that looks brilliant. I love a good chili with plenty of beans. The flavours sound delicious. Chili is perfect in the winter. We had two good snow days here so I need to make something warm! Looks yummy! Sounds delicious! I am always looking for great veggie friendly chili recipes. Too bad I can’t get vegan sausages here. Although we mainly focus on meat sausages it would be awesome to plug a recipe like this on our website. Would that be okay with suitable acknowledgement?